The North Shore is not usually thought of as mining country, and it isn’t. But one scenic strand saw heavy development in the 1950s because of mining nearly 50 miles away. Taconite mining began in the wake of World War II to forge new steel after the Ally war machine had nearly exhausted the Range’s supply of hematite, a high-grade form of iron ore. Taconite is a low-grade ore that forms nearer to the surface than hematite. In the 1910s, a process was invented at the University of Minnesota to create hard pellets, resembling rusty marbles, from concentrated taconite powder. The process of mining, concentrating, and pelletizing taconite is extremely expensive, and only economical on a massive scale. It was not until the effort of extracting iron ore from underground reserves was totally cost restrictive that two companies were organized to produce taconite pellets on a full scale: Erie Mining by Pickands Mather & Company and Reserve Mining by Armco Steel and Republic Steel. As the firms acquired the mineral rights to low-grade deposits, once considered useless, they began to plan how to build and connect their mines, pelletizing plants, and maritime shipping facilities. The staffing requirements for these was immense, necessitating that each firm build a company town for their workers. Where these company towns were placed reflected the way they processed taconite. Reserve would combine pelletizing and shipping at one location, where they established Silver Bay in 1954. Silver Bay was designed to receive ore from the Babbitt Mine, which was later renamed the Peter Mitchell Mine; the mine shared a namesake with an aforementioned ghost town, Mitchell. Erie took a different approach by combining mining and pelletizing at one location–where they built the new Iron Range town of Hoyt Lakes in the early 1950s. It would incorporate in 1955. 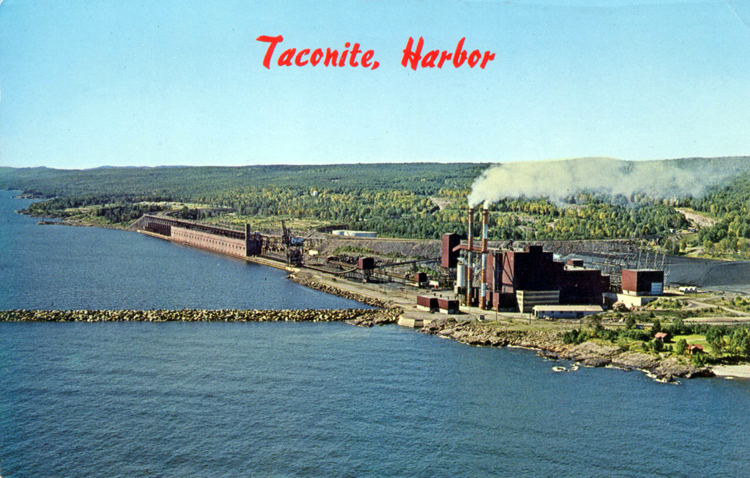 From the Hoyt Lakes furnaces, still-warm taconite pellets would be shipped to a new dock about 28 miles northeast of Two Harbors, Minnesota by a company railroad. The dock, though massive, would require relatively few workers to operate and maintain it; Erie would not be building its own Silver Bay. In 1953, about a year after it broke ground on its new company town, Erie began work on its Hoyt Lakes pelletizer. That same year, crews began blasting at the dock site directly across from two long islands that sat parallel to the shore, a location Erie Mining coined ‘Taconite Harbor’. Hundreds of temporary jobs were created on the North Shore overnight when Erie Mining put up $3 million in contracts. To house these workers, the company created a temporary trailer city between the lakeshore and highway, one that would eventually include about 500 8- by 20-foot trailers. Nearby, a permanent two-story structure housed a restaurant and grocery. Pictures show rows upon rows of trailers adjacent to a big parking lot, the predecessor of the now-ghostly Taconite Harbor community. Barge cranes lifted 325,000 tons of concrete into place between the two natural islands to form a breakwater to protect the concrete dock from Lake Superior’s famously ruthless storms. The dock could accommodate two ships at the same time alongside its concrete face, and load ships faster than any of the state’s other ore docks in Duluth, Two Harbors, Silver Bay, and Wisconsin’s Superior and Ashland. Not only was it quick, but it was also designed to handle an immense 7.5 million tons of pellets annually. Just to the north, ground broke on a power plant that would produce enough electricity to power a small city—and in Silver Bay work began on a processing plant that would require that electricity to operate. When construction crews finished and Taconite Harbor came online in 1957, the company pulled the trailers away and began shaping a smaller and more permanent community: the town of Taconite Harbor. Its two-dozen houses offered some of the best views of Lake Superior along the north shore. Homes came in 3- and 4-bedroom models, and those assigned to foremen included fireplaces. It was a good place to live. The processing plant at Hoyt Lakes and the plant and dock at Taconite Harbor were a big success; up to 150 boats visited the dock annually and it broke several loading records, such as when the Edmund Fitzgerald took on 29,689 tons of taconite in 1968. While “the Fitz” did not sink after leaving Taconite Harbor (Allouez’s Dock #1 in Superior holds that distinction), the Daniel J. Morrell, a 603-foot ore carrier, was headed for Erie Mining’s new dock on November 29th, 1966 when it snapped in half, taking 28 men down with her. The combined pelletizing-shipping plant in Silver Bay was still turning out taconite for Reserve in 1973 when it was cited for ejecting 67,000 tons of waste rock into Lake Superior in one day. The ensuing nine-month-long legal battle climaxed when US District Court Judge Miles Lord ordered the pelletizer at Silver Bay shut down in April 1974. Over night, about 3,000 workers lost their jobs. At the time, the plant was responsible for producing about 15% of the nation’s iron ore. Eventually, courts ordered that the company must dispose of the tailings on land, which it does to this day. Life and work at Taconite Harbor was not much affected by the ruling, though Erie Mining was increasingly in financial trouble. In July 1986, amidst its own Chapter 11 bankruptcy proceedings, LTV Steel acquired and absorbed Erie, renaming everything to ‘LTV’ in the process. As the company restructured there were massive layoffs, and the Hoyt Lakes plant even closed. Many of the homes in Taconite Harbor became empty as former Erie employees moved elsewhere. For a short period, some of the homes were rented to the public. LTV did not see itself as a landlord and it was eager to shed costs of its lesser company town on Lake Superior. In 1986, LTV asked the residents of Taconite Harbor to find another place to live, and the houses were sold and moved, one by one, down Highway 61. Those that did not sell were demolished. The evicted residents reacted with a sense of finality. “I don’t know where we are going if we cannot stay here,” said the wife of an LTV electrician who had raised three children in the company town. Another resident complained, saying that, “It’s understandable. It’s just that it’s a shock. I understand their point, but it doesn’t help me.” The population dropped from 74 in May 1986 to 12 in November 1987. The company’s goal was “to have the town empty by June ,” according to a spokesman. The last house was not moved until 1990. After restructuring, LTV proposed to use the town site as a storage dump for dolomite and limestone, two ingredients in the taconite pelletizing process. This plan was cancelled for environmental reasons, and the land remains unused. Today, where the houses stood are overgrown, empty streets, and trees veil the streetlights in a forgotten neighborhood. The dock shut down in June 2001 and remains unused, although Minnesota Power still operates the nearby power plant.